Can these popular beauty products live up to the hype? Mineral makeup is popular, but is it worth the price? Top makeup artists and skincare specialists sound off on whether mineral makeup deserves its kudos. "I love it," Kerry Herta says. Herta earned a 2011 Emmy nomination for her work on the daytime soap All My Children. "I use a mineral foundation myself. It’s so natural looking it’s like a second skin. And on hot humid summer days it wears better than traditional liquid makeup." Tasha Reiko Brown of the Style Network’s How Do I Look is not as big a fan. "I find it collects in fine lines and pores and accentuates dry flaky areas," she says. "If you’re a woman of color, it can be very difficult to find a shade that’s a good match for your skin." Women often differ over their choice of makeup products. What's hype and what's reality? Bare Escentuals started what it dubbed "The Mineral Revolution" when it launched its loose powder foundations in the mid-1970s. Then competing brands came out with new products, claiming that mineral makeup was more "natural" than conventional makeup. Perry Romanowsksi, author of Can You Get Hooked on Lip Balm? Top Cosmetic Scientists Answer Your Questions About the Lotions, Potions and Other Beauty Products You Use Every Day, doesn’t see it as a revolution. "All makeup is mineral makeup," he says. "You’ll find the same mineral ingredients -- titanium dioxide, zinc oxide, mica, and iron oxides -- in conventional products." Mineral makeup ingredients aren’t simply mined, pulverized, and poured into compacts. "I’d like someone to show me a zinc oxide mine," cosmetic chemist Ni’Kita Wilson says. "It doesn’t exist. Zinc oxide is synthesized in the lab." Titanium dioxide, another mineral makeup mainstay, starts out with natural titanium. But it also undergoes an extraction and purification process in the lab. That's a good thing. "There isn’t any natural source of titanium that’s pure enough to be used in cosmetics," Romanowski says. "It’s all contaminated with things like mercury and lead." What makes mineral makeup different from traditional makeup isn't the ingredients it contains but what’s left out. For many leading brands, the list of left out ingredients includes preservatives, parabens, mineral oil, chemical dyes, and fragrance. Many dermatologists recommend mineral makeup based on the fact that these left out ingredients are possible skin irritants. "I’m very bullish on mineral makeup," New York dermatologist Neal Schultz, MD says. "It’s much less likely to cause a reaction in women with sensitive skin. And because it doesn’t contain oil, it won’t aggravate acne-prone skin." Chicago dermatologist Brooke Jackson, MD, who uses mineral makeup herself, recommends it to her patients with rosacea and eczema. She also suggests it to women with sensitive skin. "Women in their 30s and 40s will come in and say they have bathroom counters filled with products that have caused reactions because of one ingredient or another," Jackson says. "When they try mineral products, many are finally able to wear makeup for the first time in their lives." Mineral makeup won’t replace of your moisturizer, acne cream, or anti-aging serum potions. But it does offer some skin care benefits. Titanium dioxide and zinc oxide are both physical sun blocks, so an even application of mineral makeup provides some sun protection. "It’s sufficient for those days when you’re just running a few errands outside," Jackson says. "But if you’re going to be spending hours outdoors on a sunny day, choose a sunscreen with an SPF 45." Zinc oxide is also an FDA-approved skin protectant. "It has some anti-inflammatory properties, so you’ll see it in products like diaper-rash ointment," Wilson says. "Since mineral makeup contains a higher percentage of zinc oxide than traditional makeup, it can be useful in calming irritated skin." Some people have been concerned that mineral makeup is micronized into ultra-small particles called nanoparticles that can penetrate the skin’s barrier and trigger potentially harmful reactions. However, Romanowski says, "if the particles were actually the size of nanoparticles they’d be useless in makeup because they’d become transparent and wouldn’t offer any coverage." Some media reports have advised women to scan labels for bismuth oxychloride, the ingredient that gives makeup its pearly finish. It’s been said to cause skin irritation and acne flare-ups, leading some mineral makeup companies to eliminate it from their formulas. Jackson says that only a very small minority of people with highly sensitive skin will find themselves irritated by the ingredient. "These are women who react to so many ingredients that they’ll probably want to have their dermatologist perform skin patch tests to identify what might possibly cause a reaction," she says. "For the vast majority of women, bismuth oxychloride is perfectly safe." Mineral makeup has gone far beyond its beginnings as a loose powder foundation. 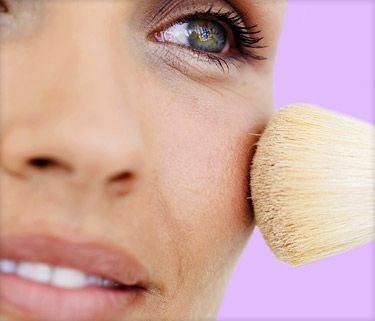 Today, you can find blush, bronzer, eye shadow, lipstick, and even liquid foundations presented as mineral products. A funny thing has happened as mineral makeup has gained popularity. Cosmetics companies have added back the ingredients they omitted when they first introduced mineral products. After reading the list of 12 ingredients in a so-called "mineral eye shadow" from a drugstore brand, Wilson laughs. "If you hadn’t told me that was the ingredients list of a mineral product, I would have said it was just your run-of-the-mill eye shadow." Wilson says it’s impossible for mineral makeup companies to create a liquid foundation with a pared-down ingredients list. Microbes thrive in water, so liquid formulations must include some kind of preservative, she says. Without it, contaminated products can lead to skin infections. The bottom line? If you have sensitive skin, you might want to try loose mineral powder foundation. Look for products with the shortest ingredients list. With a longer list of ingredients, there's more chance that your skin will react to something, Jackson points out. Mineral makeup is also an option for people who don't have sensitive skin. Just keep your expectations in check. "No one product, including mineral foundation, is going to correct problems like large pores and uneven pigmentation," Herta says. "To address those concerns you need primer, concealer, and the right skin care regimen." Kerry Herta, makeup artist, Los Angeles. Tasha Reiko Brown, makeup artist, Los Angeles. Ni’Kita Wilson, cosmetic chemist, vice president of research and innovation, Englewood Lab, Englewood, N.J.
Perry Romanowski, cosmetic chemist; author, Can You Get Hooked on Lip Balm? Top Cosmetic Scientists Answer Your Questions About the Lotions, Potions and Other Beauty Products You Use Every Day and Beginning Cosmetic Chemistry 3rd Edition. Neal Schultz, MD, dermatologist, assistant clinical professor, Mount Sinai Medical Center, New York. Brooke Jackson, MD, dermatologist; clinical assistant professor, Northwestern University Feinberg School of Medicine, Chicago.